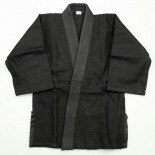 Black Judo Uniform, single weave Jacket features reinforced shoulders and lapel. Drawstring pants feature sewn down padded knee and full gusset. Sizes 000-0 come with an elastic waist and inner drawstring. 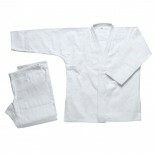 • Size: 000-7 • Belt included • 100% cotton ..
Black Jujitsu Uniform, Brazilian Cut SINGLE WEAVE. 100% cotton. 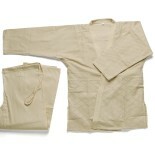 550 gram durable jacket with heavy lapel and reinforced shoulders. • Size: 000(K0) - 7(A5) • Belt included • Available color: White, Blue .. Jacket features reinforced shoulders and lapel. Drawstring pants feature sewn down padded knee and full gusset. Sizes 000-0 come with an elastic waist and inner drawstring. 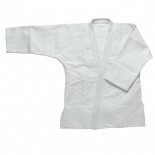 • Size: 000-7 • Belt included • 100% cotton ..
Quality double weave, 24 ounce, heavyweight uniform features a deluxe stiffer lapel, reinforced shoulders, and taped sleeves. Drawstring pants padded from knee to ankle. Also comes with taped ankles and side vents. 100% cotton. .. 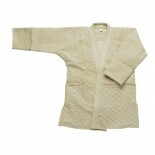 Jacket features reinforced shoulders and lapel. Drawstring pants feature sewn down padded knee and full gusset. Sizes 000-0 come with an elastic waist and inner drawstring. 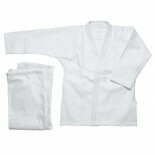 • Size: 000-8 • Belt included • 100% cotton ..
Drawstring pants feature sewn down padded knee and full gusset. Sizes 000-0 come with an elastic waist and inner drawstring. • Size: 000-8 • 100% cotton ..
Quality double weave, 24 ounce, heavyweight uniform features a deluxe stiffer lapel, reinforced shoulders, and taped sleeves. Drawstring pants padded from knee to ankle, comes with taped ankles and side vents. • Size: 3-7 • 100% cotton. .. Jacket features reinforced shoulders and lapel. Drawstring pants feature sewn down padded knee and full gusset. Sizes 000-0 come with an elastic waist and inner drawstring. 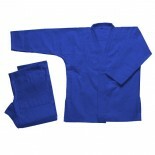 • Size: 000-8 • Color: Blue • Belt included • 100% cotton ..
Quality double weave, 24 ounce, heavyweight uniform features a deluxe stiffer lapel, reinforced shoulders, and taped sleeves. 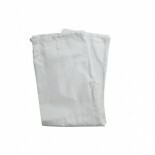 Drawstring pants padded from knee to ankle, comes with taped ankles and side vents. • Size: 3-7 • 100% cotton .. SINGLE WEAVE. 100% cotton. 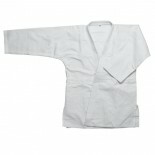 550 gram durable jacket with heavy lapel and reinforced shoulders. • Size: 000-8 • Belt included • Available color: White, Blue .. DOUBLE WEAVE. 100% cotton. 24 ounce heavy duty jacket. Drawstring pants with padded knee down to the ankle. Ideal for advanced students and competition. • Size: 3-7 • Color: White .. SINGLE WEAVE. 100% cotton. 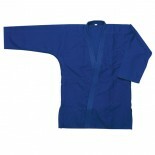 550 gram durable jacket with heavy lapel and reinforced shoulders. • Size: 000-7 • Belt included • Color: White, Blue ..